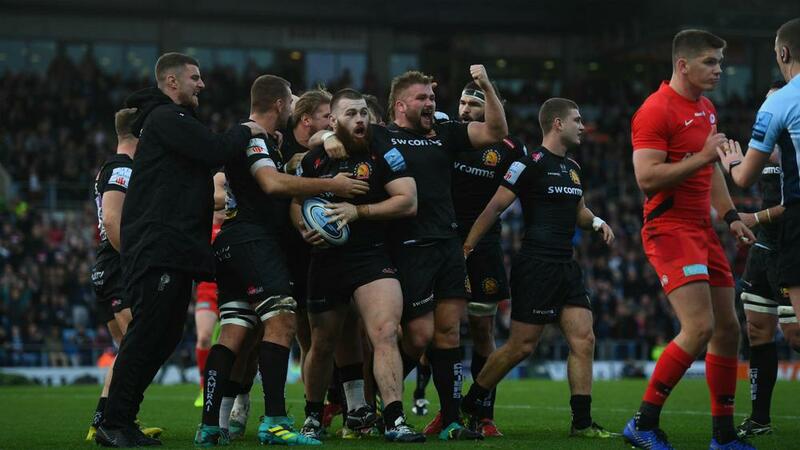 Exeter Chiefs ended Saracens' 22-match unbeaten run win a 31-13 bonus-point victory to replace the champion at the top of the Premiership and Leicester Tigers halted its eight-match losing streak. Sarries had not been beaten since Leinster dumped them out of last season's European Champions Cup at the quarter-final stage in April, but finally came unstuck at Sandy Park in this one. Mark McCall's side made a strong start in the first meeting between the top two since it beat Exeter in the 2017-2018 Premiership final and was rewarded with two Owen Farrell penalties after losing captain Brad Barritt to concussion. The Chiefs responded well and led 10-6 at the break, Luke Cowan-Dickie scoring the opening try after Sam Skinner charged down a Ben Spencer kick and Gareth Steenson slotting over a penalty after his conversion had sailed through the posts. Harry Williams added a second try when Sarries were outmuscled in a scrum, then a penalty try and a Matt Kvesic score either side of a Spencer try put Exeter three points clear at the summit. Leicester stopped the rot in its first game since Geordan Murphy was named head coach on a permanent basis, seeing off Harlequins 35-24 at Welford Road. Jonah Holmes scored a first-half double, then Manu Tuilagi and Jonny May went over as the Tigers moved just a point behind Quins in sixth spot. Robert du Preez scored 17 points with the boot in a 27-10 victory for Sale Sharks over Bristol Bears in the day's other match.